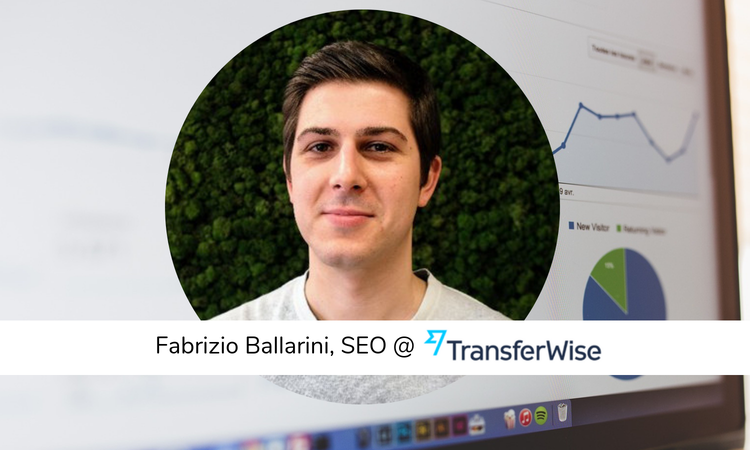 Interview with Fabrizio Ballarini, SEO at TransferWise, the clever new way to convert money to send abroad. Fabrizio is a big fan of SEO tools and he shares great tips and tricks on how to run SEO in a fintech startup. Today, in our interview session we have Fabrizio Ballarini from TransferWise. Fabrizio is managing SEO and Organic Growth at Transferwise, the London-based international money transfer service, one of Europe's more promising fintech startups. He is a great fan of using SEO tools and I encourage you to check his presentations on Slideshare. We invite you all to read the interview, Fabrizio has given a lot of insights on how to run a successfull SEO strategy and how to stay on top of your game. Do you mind telling our readers a little bit about you and what you do? Hi everyone, my name is Fabrizio. I work in the Organic Growth and SEO team at TransferWise. My team mission at TransferWise is to acquire customers at 0 cost by building products, platforms and content that educate and solve customer problems. Before bootstrapping my current team at TransferWise I used to consult enterprise clients across finance, e-commerce & tech at Neo@Ogilvy, Ogilvy's performance marketing agency. I’m Italian but based in London since 2013 and I’m really passionate about search engines, online communities, startups, slightly obsessed with exchange rates and bringing transparency to the finance industry. When you started doing Search Engine Optimization ? Professionally in 2013 but I have been online since my first 56k modem. A lot of concepts were not new to me and had somehow played with it for a while, I just didn’t have a clear idea on how that could be a full time job. I guess that starting my career in UK helped as there is more specialism in marketing compared to Italy where I’m originally from. I’ve been working in SEO full time since and still enjoying it as it can give you exposure to many different disciplines. What’s your advice for SEO specialists that works in fintech? Google is the same no matter what industry you working on, there are vertical specific search features but fundamentally working in fintech doesn’t require a different preparation or skills to other verticals. What surprised me coming from consulting retail banking clients is that there is still plenty opportunity for new players. Finance is always seen as a very competitive vertical, that is true to some extent but not always since incumbents didn’t have the necessity to innovate as they already had customers to buy their products. New players are slowly unbundling products of traditional banks which creates a lot of opportunity to produce content and build products that help customers to navigate through various providers. As general advice I would say to not overlook the lack of basic educational content that could help customers to choose the best products. What are some Google myths that fintech startups should ignore? Unfortunately too many to start listing them here. In general I always advice not to worry about Google to start with. While it’s healthy to have a sense from day one if the product you building has got search demand, is not critical. I always advise to focus on product in order to build a 10x alternative to the point customers naturally recommend it to their friends. Understanding of Google search won’t fix your product, often I speak to startups asking about SEO without having a product that actually solves well a real problem. At TransferWise we started the SEO program and organic growth initiatives at year 4 when Word of Mouth was already driving more than half of our growth. I understand is not always so simple but without a viral product, SEO will be harder. Rather than spending time building products and content to help customers you would have to worry about promoting your site which takes time and resources that generally startups don’t have. You are a big fan of SEO Tools. Which ones you recommend as a must-have in every SEO specialist’s arsenal? When I first joined TransferWise we had more tools that I could possibly look at, so I cancelled all subscriptions and started from zero. First thing I would advise is to use your own data from Goolge Search Console, we built a custom tool to leverage Search Console API but there are plenty tools out there that help you connecting to it. I would then get a crawler to help you with analysis at scale and a tool that provide you with a decent search index, we use Screaming Frog as crawler and then sign up to SEMRush and aHref for keyword data and historical search indexes. That is to me the essential, then depending on your setting it makes sense to build your own solutions using APIs as we generally do or buy tools that do what you need out the box. And lastly but most important than any mentioned before it’s your browser, seems obvious but it’s the only essential tool you need. What are the tasks a SEO Manager should execute on a daily basis? Everyday is different when you work for a fast growing company and I think that anything you mechanically have to do on a daily basis should be automated with code aside from analysis of data where you need to make a call on what’s going on. Yet most of our reports are automated and depending on how fast each site component is growing we look at it more or less regularly. For any other activity we have quarterly plans and dedicated sprints but it rarely requires something to be repeated on daily bases. As SEO my only advice is to read news every day to stay on top of what’s going on and learn from peers in the industry. I do it mostly through my twitter feed but there are many different ways to keep up with what’s going on in the industry. In TrasferWise how many people involved on SEO Tasks? Started with me and 3 full stack developers, we now have a full stack team with SEO specialists who also own growth products, backend and frontend developers, analysts, designers, copywriters and content specialists. We operate autonomously from core TransferWise product team with the only objective of driving organic growth. Being independent from a resource perspective is really important for SEO to avoid being blocked on engineering side and having to depend on teams that operate against different objectives. In your opinion what’s going to be the next great thing in SEO that will change the way SEO is done now? Thank you very much Fabrizio for answering our questions and we wish you all the best.